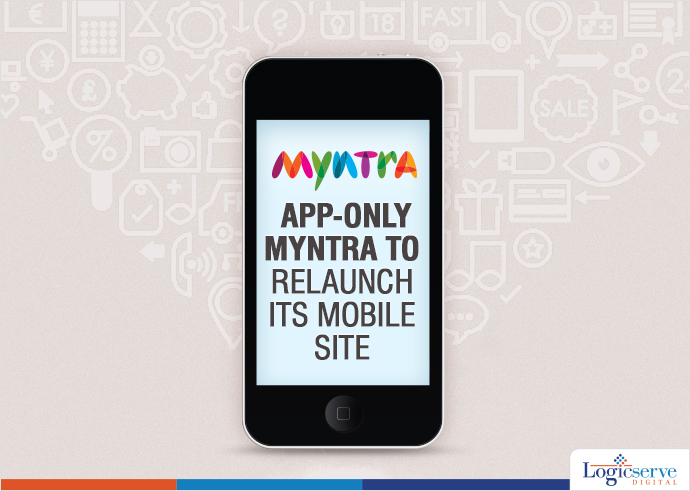 After closing their mobile website last year, and making it app only shopping medium, Myntra has officially announced their relaunch of mobile site. India’s top online fashion retailer, Myntra is no longer limited as an app-only website. It is re-launching its mobile site with an aim to bring back its lost customers. This strategic move comes after Flipkart selling its products only through a mobile app and completely shutting down its website. It created waves among the online retail start-ups and triggered debates whether the app-only strategy will boomerang or will it really work. Myntra’s head of products, Ambarish Kenghe said that the company will stand by the mobile-only strategy and there are no plans to relaunch the Myntra’s desktop site. The users will have an option to buy from the website; however they will nudge them to download its app. According to the experts, Myntra can now attract consumers who search for the brand online; however, they either feel reluctant to download the app or uninstall it to clear their phone’s memory. On condition of anonymity ex-Myntra official said that the consumers who don’t have an app are diverted to a link to download it. This is not only a dead end for the consumers, but also missed opportunity for Myntra. The e-tailer’s officials said that this fiscal the company might miss its target of achieving $1 billion annual GMV (Gross Merchandise Value) by a hair’s breadth and so plans to achieve it by March 2017. Last year, in the month of May, Myntra moved to an app-only model for two reasons. The first being, 70% of its revenue came from mobile applications and secondly to target the mobile-first generation. Abhishek Rajan, Mobile business head at Myntra had said that losing out on the desktop audience was the cost company was ready to bear.